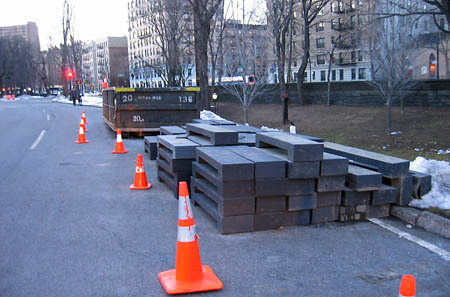 The steel bases for The Gates were being loaded into dumpsters Saturday near Harlem Meer. Good-bye orange ephemeral artwork! With any luck I will be on the bus to work when this is posted. I had an enjoyable week off. It is going to be difficult to get out the door early in the morning. I met my goal of having lunch at five different places. Four places were new to me. Monday: Pulled-pork sandwich at the 2nd floor cafeteria at MoMA. Sandwich was good. The ingredients were fresh. I should have had the awesome looking flan. Too bad you can't get to the cafeteria without going to the awful museum. Tuesday: Rickshaw Dumpling Bar, W 23rd St. If you're going out for dumplings go to Chinatown, they are cheaper and better there. That said, the wasabi and shrimp dumplings (6 for $4.95, add $3 if you want a salad) I had here were good. Don't worry, there's hardly any wasabl. Wednesday: Land Thai Kitchen, 82nd and Amsterdam. Their $7 lunch special gets you an appetizer and an entree. It's a good deal and the food was good. I had a green papaya salad and drunken noodle with chicken. The salad was on the small side. That left room for dessert --molten chocolate cake with ice cream. Thai iced tea comes in a rotund terracotta jug that requires two hands to lift if your hands are smaller than mine. Thursday: Birthday trip to Dinosaur BBQ. Thought I'd be nice and give them another try. No improvement over my previous visit. I ordered the pulled pork and ribs combo ($12.95). The sides were mac and cheese and collard greens. I forgot to order the sauce on the side. Turns out the sauce was needed because the pork was so dry. Ribs were flavorless. Big disappointment. I won't be back. Unexpected bonus: search Chowhound or the web for this place and you'll find unintentionally hilarious remarks from people about being in "scary" Harlem. Friday: Splurged at Café Sabarsky at the Neue Galerie (86th and 5th Ave). Let's just say this lunch cost more than all the other lunches last week combined. The value of the lunch was also greater than all the other lunches combined. Pan-seared arctic char with semi-caramelized onions, bacon and green beans. A beautiful salad of mixed greens. Esterházyschnitte (hazelnut cake with vanilla butter-cream) for dessert. So good. Tip: Don't go to the Galerie unless the third floor exhibits are open. It was reduced admission on Friday because they were installing a new exhibit. The permanent collection on the second floor is very small and is contained in 2 rooms. Unexpected bonus: Walked past Mayor Bloomberg's house on 79th St. as Mayor Bloomberg arrived. Unrelated: Today is the final day to get dollar cream puffs in honor of the Upper West Side Beard Papa Sweets Cafe's first anniversary. We have Beard Papa here? I thought that was only in Japan? People would queue around the block to get those puffs in Tokyo. Mad for it. There are two Beard Papa's! Both on Broadway. The first is between 76th and 77th and the other is at 8th St.
Everything I know about Harlem I learned from a Country Joe McDonald song. And, of course, you. I make no claims for the accuracy of my tour guide information!